Cecilia de Torres Gallery, New York. We are grateful to Mrs. Cecilia de Torres for her assistance in confirming the authenticity of this work. José Gurvich was born in Trakai, Lithuania. In 1931, José Gurvich's father left Lithuania, making his way to Uruguay in search of religious tolerance and a better economic situation for his family. Two years later, the family was reunited in Montevideo, Uruguay. José Gurvich joined the workshop of Joaquín Torres-García in 1945. Founded in 1943, the Taller Torres-García worked towards broadening the definition of art by including materials traditionally associated with craft traditions. These included ceramics, stained glass, mural painting, wrought iron, textiles, jewelry and other functional objects, in addition to painting, sculpture and printmaking. Perhaps the most important of Torres-García's teachings, and certainly influential to Gurvich, was his belief that art and life should necessarily co-exist. For him, no single art form was superior to any other, so that architecture, painting and hand-crafted objects were equal and should each be given equal consideration. Learning closely from his mentor, Gurvich began working in his style and adapting the philosophies encouraged in the workshop. After Torres-García died, in 1954, Gurvich made his first trip to Europe and traveled extensively, closely studying the work of Brueghel and Bosch. He also copied paintings by Velázquez and by Goya. During this period, he also spent time working as shepherd at a kibbutz in Israel. This confluence of European art, South American life and Israeli traditions was evident in his personal life and also surfaced in his work. Becoming one of the most important figures in Constructivism, Gurvich eventually moved to New York City in 1971. 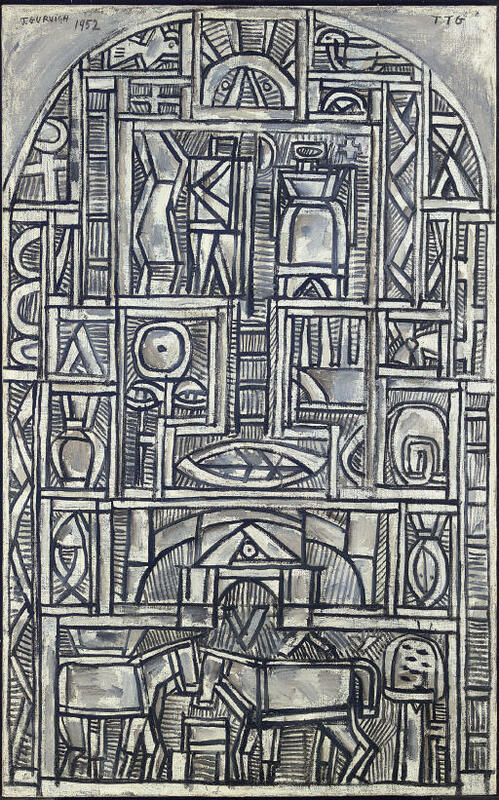 He was preparing for a large solo exhibition at the Jewish Museum when he passed away in 1974. An active artist throughout his short lifetime, Gurvich developed his own personal inventory of imagery that employed Constructivist principles and, later in his career, borrowed occasionally from Surrealism. This painting embraces many of the School of the South philosophies as they were developed in the Taller Torres-García. The pictorial language is inspired by the pictographic language system of pre-Hispanic culture groups from Central and South America. It also represents a larger attempt to create a universal language that is about the human place within the universe. The symbols seen in the work, which include horses, trees, feathers, eye-like forms, vessels, male and female figures, suns, birds and references to architectural structures, carry the meaning of the work and its deeper narratives. The main shapes used throughout the work, the cube, the pyramid and the sphere, were the frequently employed by Torres-García as elemental forms that signified stability and permanence. Significantly, the main part of the painting has a rounded, altar-like shape. With this shape, it reads like Mayan stelae. Traditionally, these works were public monuments on which important information about a leader or a significant event was carefully recorded. Read in this fashion, the work becomes a visual narrative that proclaims the significance of ancient civilizations, employs figures that refer to universal man and mother earth, and underscores the anthropological connection between historic cultures and modern artistic production that the Taller espoused.